The protestor camp at 8th and Cherry Streets, outside the ICE office, in Philadelphia, July 5, 2018. Lewis Hospers has lived in Philadelphia for less than a week, and already has been handcuffed by police and cited — twice. The 18-year-old from New Hampshire moved to the city to stay with family, but this week camped outside near Eighth and Cherry Streets as part of a protest that turned into a four-day occupation of the space outside a federal office building. Hospers, who was among those rounded up by police on Tuesday and Thursday, remembers being about 11 and feeling inspired when Occupy Wall Street protesters were on TV. But is Occupy ICE the second coming of Occupy Wall Street? "This is something different," Hospers said. "We've got the spirit of it, though." Hundreds of protesters who withstood extreme heat and thunderstorms over four days served as Philly's version of what's become a national movement calling for the abolition of Immigration and Customs Enforcement by camping outside federal offices to "Occupy ICE" — a name that harks back to Occupy Wall Street, the 2011 nationwide protest against corporate greed that some say ushered in today's Democratic Socialist movement. The group had begun to create a tent city of sorts, complete with beach umbrellas and an inflatable unicorn with the words "No Cages" written on the side. But Philadelphia police raided the camp Thursday afternoon, and it was largely destroyed. Enav Emmanuel, a spokesperson with Philly Socialists, said after the raid that organizers were regrouping and deciding what's next. While demonstrators say they weren't aiming to replicate Occupy Wall Street — some discussed mistakes they believed the protracted occupation made seven years ago — its influence could be felt. Organizers took a line from the original Occupy and organized the camp into sections, including a space for donated food, a "medic tent," where people kept first aid kits and sunscreen, plus a space for books, games and other ways to pass the time. And when a line of police with bicycles pushed out demonstrators on Thursday and held a line in front of the encampment while they collected tents and threw them away, one woman yelled: "We are the 99 percent!" The rally cries were similar to Occupy, as were the grievances. Joe Cox, a protester who said he spent about 30 hours in total at the encampment, was wearing a T-shirt with Bernie Sanders' face on it and said he was there to protest against "corporations making millions off putting kids in cages." Cox said he wasn't involved with Occupy Wall Street in 2011 but was among those who protested at the Democratic National Convention in Philadelphia in 2016. "Bernie inspired me," he said. Preparations for the demonstration, organized largely by leftist political groups such as Philly Socialists, Reclaim Philadelphia and Philly's chapter of the Democratic Socialists of America, began well before the occupation. Organizers set up an account on money transfer app Venmo to collect cash for bail and citations. They set up a document to schedule medic shifts. They found allies — comrades, they call them — who lived or worked nearby who could offer bathrooms, showers, and dumpsters for trash collection. Protester Jenny Holt takes an Inquirer reporter and photographer on a tour of the protester camp located at Eighth and Cherry Streets, outside the ICE office, in Philadelphia. They bought some food and water but expected donations, soliciting them on Twitter and Instagram, where they also called for mobile battery packs, speakers to play music, and mats for sleeping. By Thursday midday, shortly before the raid that destroyed the camp, they had too much food and more than enough money for bail, according to Mara Henao of the Philly Socialists. In an interview, she encouraged supporters to donate to organizations doing immigrant justice work such as Juntos or New Sanctuary Movement instead. >> READ MORE: Did Philly just bike-doze Mayor Kenney's relationship with progressives? The organizers also communicated with other Occupy ICE groups across the country, who told them to prepare people for clashes with the police. The Philly group asked people to volunteer as "de-escalators" who would help calm encounters with the police. People circulated in and out of the camp throughout the last four days, including Henao, 29, who works as as a medical interpreter. "I don't stay here 24/7," Henao said. "I can't. I have two kids and a job." 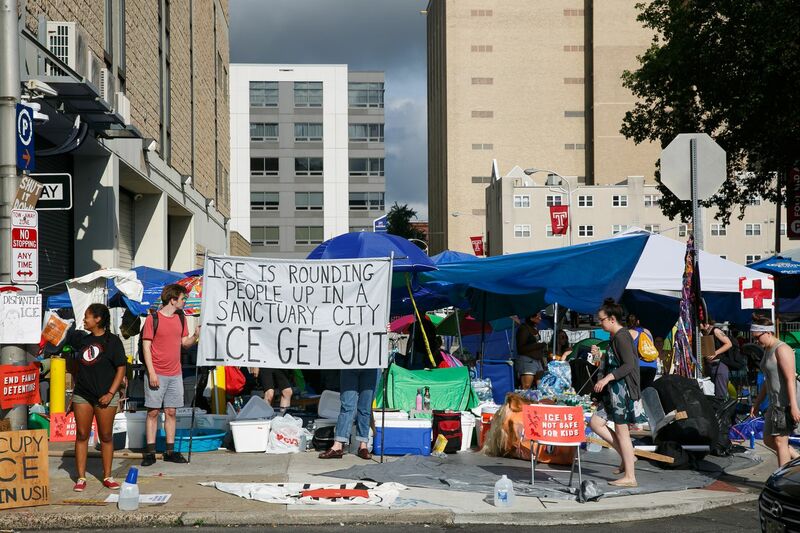 Miguel Andrade, a spokesperson with Juntos, a South Philadelphia-based immigrant organization, said that while the group didn't organize the occupation, it supports the Occupy ICE demands. He said its goals align with work Juntos and other immigrant advocacy organizations have been doing for years. "It's honestly a breath of fresh air," he said, "seeing so many people being galvanized and mobilized" on behalf of immigrant communities. In addition to abolishing ICE and closing the immigrant detention center in Berks County, protesters have asked the City of Philadelphia to end a data-sharing agreement with the federal government used by ICE. City officials said they have not yet made a decision as to whether they will renew the existing license agreement past its current term, which ends in August. Emily Reed, a 22-year-old who lives in University City, hopes ICE is abolished, but understands that's an ambitious goal. "I realize that's lofty and unrealistic," Reed said, "but at this point, it's kind of more of a symbolic occupation than necessarily a practical one." Jenny Holt, a 27-year-old from South Philly, sporting a blue visor with a piece of masking tape that read "PROSECUTE ICE," who camped out for several nights, said she agreed. "It's more about being here," she said, "and showing face."